Australia Day 2019 falls on Saturday 26 January, but it’s observed on Monday 28 January—giving most people a day off. So, it’d be the perfect opportunity to schedule a long weekend holiday in Byron Bay. Combine sun, surf and the celebration of our national holiday into your plans. Byron Bay area festivities for Australia Day feature: a breakfast, community awards and live entertainment. Since the national holiday is just around the corner, get moving and plan to go on that holiday if you didn’t take much time off over Christmas. Plus, the holiday gives you a chance to take advantage of all the excellent things to do in Byron Bay. The summer weather will aid you in your quest to try out the Byron Bay essentials, including the beaches, surfing and a walk up to the Cape Byron lighthouse. Especially if this is your first time in Byron Bay, check out our blog post about what to do in 48 hours in Byron Bay—it’s too short a time to capture everything, but it’s a start!—and try to check off many of these must-dos on your long weekend. The ceremony is scheduled to be complete by 6:30 pm. There is an invitation-only dinner following for award recipients and guests from 6:30 to 7:30 pm. But you can join in the fun by attending the Aussie BBQ sponsored by the Ocean Shores Community Association on Saturday 26 January. See below. For the actual Australia Day on Saturday 26 January, you’ll find lots of activities going on in the Byron Bay area. Australia Day on the beach. Come down to Byron Bay’s most popular beach, Main Beach, and grab some delicious brekkie and live music, starting at 7:30 am. This event, put on by the Rotary Club of Byron Bay, will provide free Australian flags and food to attendees. Taking place next to Byron Bay Surf Club, the morning event will run through 11 am. Another breakfast option is in Brunswick Heads at the Housie Tent from 7:30 to 10 am. Breakfast will be $5 (with vegetarian and gluten-free options), and the activities include a sing along and live music. There are a variety of things to do on Australia Day 2019 in the Byron Bay area during the afternoon hours. In Byron Bay proper, there will be a Celebration of the Survival of Indigenous Culture at Main Beach that will feature dancing, music and kids activities. This event runs from 11 am to 3 pm. 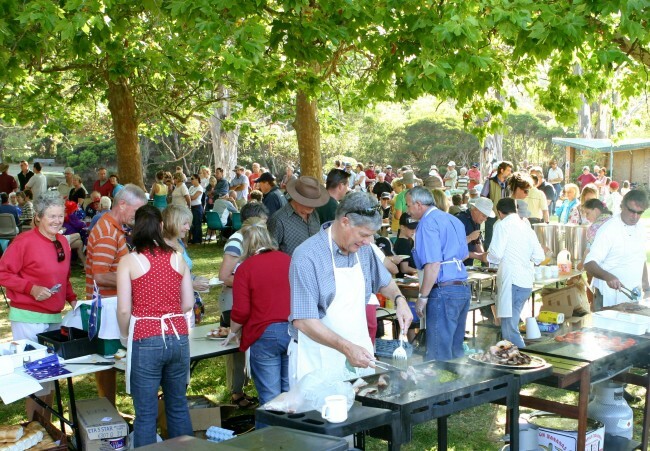 The Aussie BBQ, held by the Ocean Shores Community Association, will be from 3 to 5 pm at the Ocean Shores Public School. The event will feature a free sausage sizzle, ice pops, cake, refreshments and Australian flags. Activities available range from live music and a singalong to a mullet throwing championship. Celebrate the national holiday, Australia Day, this year by using it to give yourself a well-deserved weekend in Byron Bay. Keep costs low by booking your stay at Broken Head Holiday Park where you can choose budget accommodation from an unpowered campsite to a beach shack. Our location makes it easy to join in on the festivities in the area for Australia Day, as well as take in the Byron Bay essentials.